The second DLC story add-on of The Freedom Chronicles for Wolfenstein 2: The New Colossus, entitled ‘The Diaries of Agent Silent Death,’ has now been released. Epic Games and People Can Fly officially release the patch notes for Fortnite’s Update 2.4.0 and confirm the addition of Miniguns in the game’s Battle Royale mode. EA CFO Blake Jorgensen reveals that the company is unsure when Star Wars Battlefront 3 might release, following the controversial launch of Battlefront 2. Sony officially announces the lineup of free Playstation Plus titles for February 2018 on its Playstation Blog, with Knack and RiME for PS4 headlining the list. Nintendo officially announces that sales for its Switch console are close to 15 million worldwide, confirming the system is already outperforming the Wii U. For those Monster Hunter World players struggling to find Coral Crystal and Coral Bone in the Coral Highlands, this guide should point them in the right direction. Clash Royale: Touchdown Tournament RECAP! Join us for the first look — and first tournament — of our NEW GAME MODE: Touchdown! 8 YouTubers from around the world go head-to-head to see who’s the best! Author John LambertPosted on January 31, 2018 Format VideoCategories Clash RoyaleLeave a comment on Clash Royale: Touchdown Tournament RECAP! 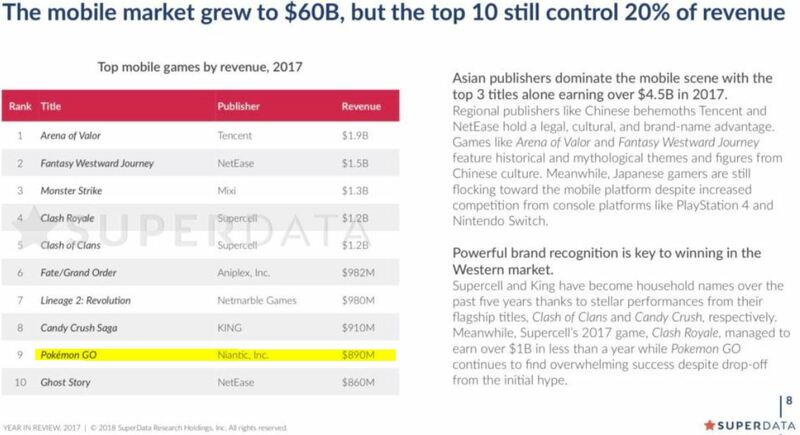 As reported by SuperDataResearch, an industry analysis firm, Pokemon Go is on the ninth place (out of ten, see the image below) when it comes down to the mobile market in 2017, and it looks like Niantic together with Pokemon Go had a very successful year with $890 million revenue. Since the release of the game, Pokemon Go had its own ups and downs, losing a lot of players, but when Niantic launched the Legendary Pokemon and Raids, everything has changed. A lot of Trainers came back to the game and started to enjoy playing Pokemon Go all over again. The year of 2017 for Pokemon Go has been good and not so good, and like any other game out there, Pokemon Go has had its ups and downs, but I have to be honest, there have been a lot of Trainers who came back and started to play and “catch ’em all” all over again, and it looks like they are still having fun. The good stuff was that Niantic released full Gen 2 and more than half of the Gen 3. The gyms got reworked, they added raids and premium rewards. Also for the first time, they released the Legendary Pokemon. The weather bonus was added and the bug that occurred at level 40 was fixed. They fixed the low spawns, they added more PokeStops and Gyms in the urban and suburban areas. 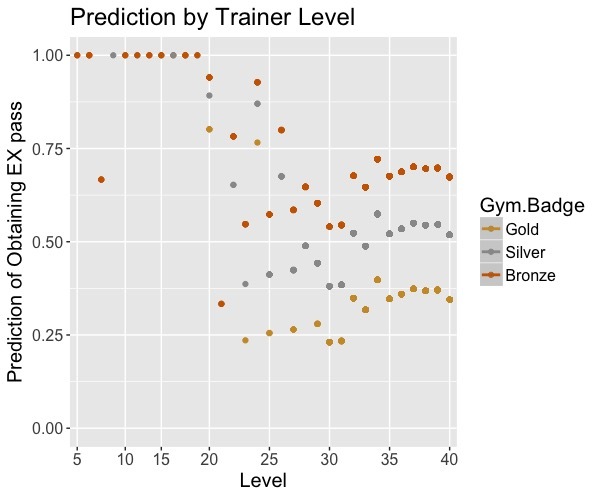 More cheaters entered the game and start to dominate the gyms. There was a problem with the EX-passes and Niantic was nowhere to be found. Now, there is a guide on what matters and what not when it comes to selection for an EX Raid Pass and you can find it here. The motivation decay rates are much faster than they were. Every account got the EX raid pass, no matter on which level the account was. Although Niantic released new content for a game that did not have many features, they are probably trying to reduce the power gap between the passionate players and the casual players. The positive thing about the new weather feature is that they encourage us to go outside and catch as many Pokemon as we can and the days where only Ratattas and Pidgeys spawned are finally gone. So, according to all data, the game has seen huge increase of its player’s base and revenue with the release of the Legendary Pokemon, Raid Battles, Super Incubators, especially with the Global Catch Challenge back in November 19, 2017, when the Pokemon Go community has caught over 3 billion Pokemon in just 7 days and activated the Gold reward. This was the key for their success, as they’ve managed to bring the community together and everyone had fun at the same time, and it was great! In our personal opinion, Pokemon Go has evolved and it is a better game than it was at the beginning. As for 2018, we have high hopes that they will release new content and something that will make us play and love the game even more. PvP and trading sound just right for me. The post Niantic and Pokemon Go had a Successful 2017 in Revenue, They’ve made $890M and Control 20% of Revenue appeared first on Future Game Releases. Hi guys my names MoePlaysFifa17, and yes that’s actually my name. This is my first guide on this website and I’m excited because I’ve always wanted to write a guide. And here i am finally writing one! And its all about one of my favorite decks this meta, Ghost Graveyard! No nerf can stop this old dude ! He has tons of HP , good damage and does splash, what else do you need? You want to use him on defense and counter push with him using a Graveyard or just stick an Ice Golem in front of him. This card was out of meta for a while, but its back and better than ever ! Those pesky Goblins just wont stop ! Goblin Hut is such a strong deck in this meta and is in so many decks. This is going to be your best starting play. Just plop it down in the middle and watch all the nice chip damage come rolling in. This is in my opinion, the best spell in the game right now. It provides an area where your opponent can’t put their troops. You should partner it up with your Graveyard when you know that they have a counter in hand. For as long as i can remember, this card has been in the meta for as long as its been released. He is a great tank and should most of the time, be pared with your Graveyard. This trio of Larrys are so good in this meta. You want to use them on defense and maybe use an Ice Wizard with it depending on the situation. This card , just like the Ice Golem, has been in the meta for such a long time. You need to use it on defense to pull cards in the middle to get maximum damage done to the opponent’s troops. You also want to make sure you activate your king Tower early on by pulling hogs and Royal Ghosts to your king Tower. This guy is so cool hes cooler than England in winter! He is going to be one of your main defensive assets in this decks and can be pared with Tornado and Guards to completely shut down any push. All other cards should be kept the same, but if you really want to sub something just comment below. Check out lolman’s Ghost Graveyard deck at here! During the start of the match, you want to place down a Goblin Hut and defend your opponent. Never start the match by cycling Ice Wizard, because of his humongous defensive value. You don’t really want to go in for Graveyards , but you can do 1 or 2 if u think your opponent doesn’t have anything to defend with. 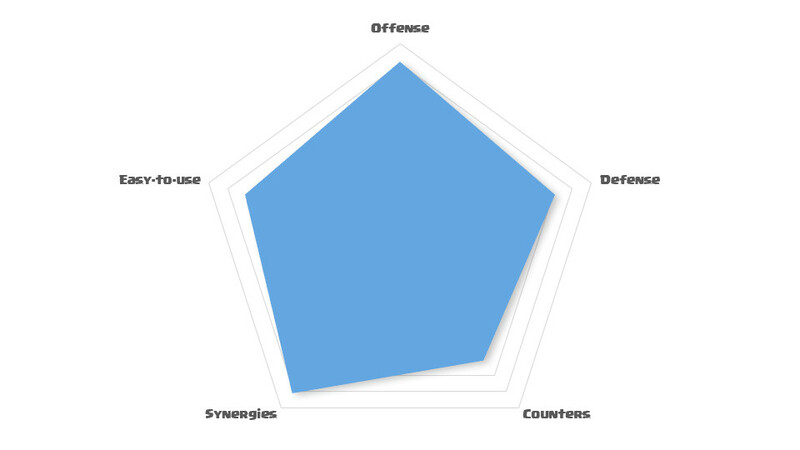 Your mostly going to be focusing on defense in the first two minutes of the game. This is when you should go in for the kill. You should constantly be sending in Graveyards with a tank if possible. But of course you should be defending the opponents pushes too, but if they do make sure to effectively defend and counter push with your Graveyard to destroy,depress and utterly dismantle your opponent. Santa Claus packs a harder punch than i thought. But it isn’t that hard to beat. Use Ice Wizard to slow him down and interchangeably use Guards and Ghost on the Giant and the support troops. This matchup is probably the hardest for me but thats probably because im just bad at defending Golems! Goblin Hut is one of the key cards in this match up. When your opponent places down an Elixir Collector, you should Ice Golem Graveyard and Poison if they use a value card that can be killed, of course make sure that the Poison touches the defenses and the Pump. When the opponent puts down the Golem, you have two options. Either to save up Elixir and make sure that you have enough to defend effectively, you should place the Royal Ghost on the support troops, If you have enough then also try to distract the support troops with the Ice Golembefore dropping RG, and use the Guards on the Golem. Use the Tornado to activate the king Tower early on and keep tornading it to the middle so that all three towers slice it into bacon. Also just make sure that you dont over commit because if you do you wont have enough Elixir to defend the Hog and use RG/Guards on the support troops. Posion the Graveyard and kill the tank as quickly as possible using RG or Guards. 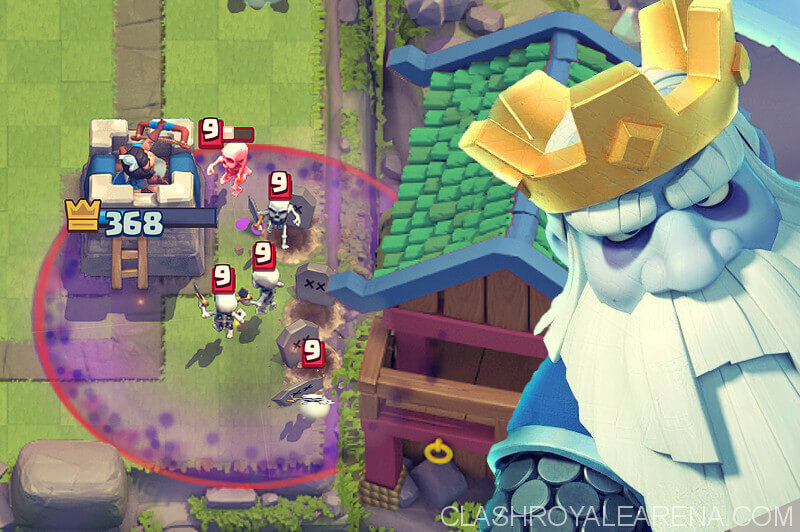 Use the Guards to defend the Miner, and kill the support with RG. Also try to activate the king Tower with Tornado by pulling Miner. One of the best legendaries right now, surround with Guards , and slow him using Ice Wizard. If this doesnt work then use the RG on the MK, I think that you should also kite him across the arena , I love watching him just walk mindlessly around the arena. Against Mortar you should use the Ice Golem to tank and Poison the Mortar and Tower, same should be done for X-Bow but might require using RG as well. Also use Ice Wizard to slow the building down. Also another powerful Legendary, you can defeat him in a similar way as Mega Knight: by surrounding him with Guards! You can also use Guards or Ice Wizard if they support him. Thats all for this guide. The post Ghost Graveyard Hut – A Funny Combination appeared first on Clash Royale Arena.